Vehicle preparation is not necessary on vehicles with MOExtended tires. A TIREFIT kit can be obtained from an authorized Mercedes-Benz Center. – Make sure that highway level is selected. – Stop the vehicle on solid, non-slippery and level ground, as far away as possible from traffic. – Engage the electric parking brake manually. – Bring the front wheels into the straightahead position. – Move the DIRECT SELECT lever to P.
– Vehicles without KEYLESS-GO: remove the SmartKey from the ignition lock. – Vehicles with KEYLESS-GO: open the driver's door. – Vehicles with KEYLESS-GO: remove the Start/Stop button from the ignition lock. – All occupants must get out of the vehicle. – Make sure that no one is near the danger area while a wheel is being changed. – Get out of the vehicle. Pay attention to traffic conditions when doing so. – Close the driver's door. 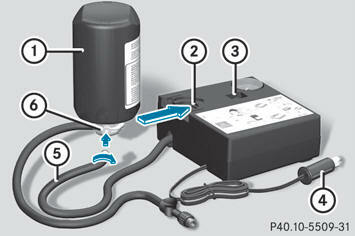 Only operate the tire inflation compressor using a 12 V socket (Y page 297), even if the ignition is turned off. An emergency cut-off ensures that the onboard electrical system voltage does not drop too low. If the on-board electrical system voltage is too low, power to the sockets is automatically cut off. This ensures that there is sufficient power to start the engine. You can use the TIREFIT kit to seal small punctures, particularly those in the tire tread. You can use TIREFIT at outside temperatures down to -4 °F (-20 °C). TIREFIT is a limited repair device. TIREFIT cannot be used for cuts or punctures larger than approximately 0.16 in (4 mm) and tire damage caused by driving with extremely low tire inflation pressure, or on a flat tire, or a damaged wheel. Do not drive the vehicle under such circumstances. Contact the nearest authorized Mercedes- Benz Center for assistance or call Roadside Assistance. – Do not remove any foreign objects which have penetrated the tire, e.g. screws or nails. – Remove the tire sealant bottle, the accompanying "max. 80 km/h" sticker and the tire inflation compressor from the stowage well underneath the cargo compartment floor. – Affix part 1 of the sticker within the driver's field of vision. – Affix part 2 of the sticker near the valve on the wheel with the defective tire. Take care not to allow the contents of TIREFIT to come in contact with hair, eyes or clothing. TIREFIT is harmful if inhaled, swallowed or absorbed through the skin - causes skin, eye and respiratory irritation. Any contact with eyes or skin should be flushed immediately with plenty of water. If clothing comes in contact with TIREFIT, change clothing as soon as possible. In case of allergic reaction or rash, consult a physician immediately. Keep TIREFIT away from children. If swallowed, rinse mouth immediately with plenty of water and drink plenty of water. Keep away from open flame or heat source. If TIREFIT leaks out, allow it to dry. It can then be removed like a layer of film. If you get TIREFIT on your clothing, have it cleaned as soon as possible with perchloroethylene. – Pull connector 4 with the cable and hose 5 out of the housing. – Screw hose 5 onto flange 6 of tire sealant bottle 1. – Insert tire sealant bottle 1 upside down into opening 2 on the tire inflation compressor. – Remove the cap from valve 7 on the defective tire. – Screw filler hose 8 onto valve 7. – Insert plug 4 into the 12 V socket. – Press on/off switch 3 on the tire inflation compressor to I. First, TIREFIT is pumped into the tire. The pressure can briefly rise to approximately 500 kPa (5 bar/73 psi). – Allow the tire inflation compressor to run for five minutes. The tire should then have attained a pressure of at least 180 kPa (1.8 bar/26 psi). If a pressure of 180 kPa (1.8 bar/26 psi) has been achieved after five minutes. If a pressure of 180 kPa (1.8 bar/26 psi) has not been achieved after five minutes. If, after five minutes, a pressure of 180 kPa (1.8 bar/26 psi) has not been achieved: – Switch off the tire inflation compressor. – Unscrew the filler hose from the valve of the faulty tire. – Very slowly drive forwards or reverse approximately 30 ft (10 m). – Pump up the tire again. If after five minutes a pressure of 180 kPa (1.8 bar/26 psi) cannot be achieved, the tire is too badly damaged to be repaired reliably using TIREFIT. In this case TIREFIT cannot seal the tire properly. Do not drive any further. – Switch off the tire inflation compressor. After use, excess TIREFIT may run out of the filler hose. This could cause stains. – Stow the tire sealant bottle and the tire inflation compressor. Do not exceed a vehicle speed of 50 mph (80 km/h). A TIREFIT repair is not designed to operate at higher speeds. The sticker must be attached on the instrument cluster where it will be easily seen by the driver. Vehicle handling characteristics of a TIREFIT repaired tire may change. Adapt your driving accordingly. – Stop after driving for approximately ten minutes and check the tire pressure with the tire inflation compressor. If tire inflation pressure has fallen below 130 kPa (1.3 bar/26 psi) do not continue to drive the vehicle. Park your vehicle safely away from the roadway and contact the nearest authorized Mercedes-Benz Center or Roadside Assistance. Have the damaged tire replaced. – Correct the tire pressure if it is at least 130 kPa (1.3 bar/20 psi) (for the required values, see the Tire and Loading Information placard on the driver's side B-pillar or the tire pressure table inside the fuel filler flap). – To increase the tire pressure: switch on the tire inflation compressor. 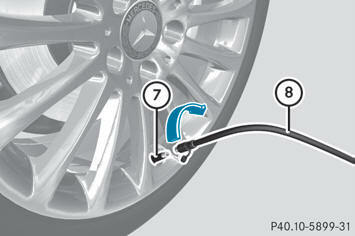 – To reduce the tire pressure: press pressure release button 9 on the filler hose. – Drive to the nearest workshop and have the tire changed there. – Have the tire sealant bottle replaced as soon as possible at a qualified specialist workshop, e.g. at an authorized Mercedes- Benz Center. Environmental note Have the used tire sealant bottle disposed of professionally, e.g. at an authorized Mercedes-Benz Center. – Have the tire sealant bottle replaced every four years at a qualified specialist workshop, e.g. an authorized Mercedes- Benz Center. The wheel and tire size of the emergency spare wheel/spare wheel may differ to that of the damaged wheel. When using an emergency spare wheel/spare wheel the handling characteristics of the vehicle may change. Adapt your style of driving accordingly. Never operate the vehicle with more than one emergency spare wheel/spare wheel that differs in size. Only use an emergency spare wheel/spare wheel of a differing size briefly and do not switch off ESP®. When using an emergency spare wheel, you must not exceed the maximum speed of 50 mph (80 km/h). Have the emergency spare wheel/spare wheel replaced with a new wheel as soon as possible at a qualified specialist workshop which has the necessary specialist knowledge and tools to carry out the work required. Vehicles without a spare wheel/emergency spare wheel are not equipped with a tire-change tool kit at the factory. 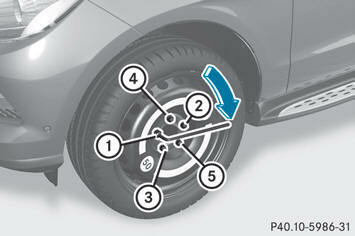 For more information on which tools are required to perform a wheel change on your vehicle, e.g. wheel chock, lug wrench or alignment bolt, consult an authorized Mercedes-Benz Center. – Prepare the vehicle as described. – If a trailer is coupled to the vehicle, uncouple it. – Secure the vehicle to prevent it from rolling away. Only jack up the vehicle on level ground or on slight inclines/declines. The vehicle could otherwise fall off the jack and injure you or others. If your vehicle is equipped with a wheel chock, it can be found in the vehicle tool kit (Y page 328). – Fold both plates upwards 1. – Fold out lower plate 2. – Guide the lugs on the lower plate fully into the openings in base plate 3. – On level ground: place chocks or other suitable items under the front and rear of the wheel that is diagonally opposite the wheel you wish to change. – On downhill gradients: place chocks or other suitable items in front of the wheels of the front and rear axle. When jacking up the vehicle, only use the jack which has been specifically approved by Mercedes-Benz for your vehicle. 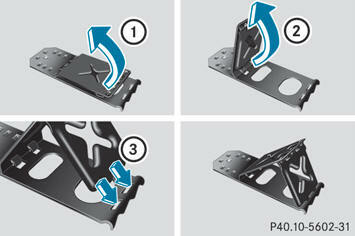 The jack is designed exclusively for jacking up the vehicle at the jacking points built into both sides of the vehicle. The jack saddle must be placed centrally under the jacking point. The jack must always be vertical when in use, especially on inclines or declines. The jack is intended only for lifting the vehicle briefly for wheel changes. It is not suited for performing maintenance work under the vehicle. 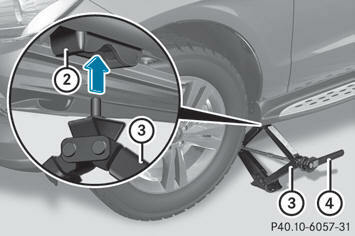 To help avoid personal injury, use the jack only to lift the vehicle during a wheel change. Never get beneath the vehicle while it is supported by the jack. Keep hands and feet away from the area under the lifted vehicle. Always lower the vehicle onto sufficient capacity jackstands before working under the vehicle. Always firmly engage the parking brake and block the wheels with wheel chocks or other sizable objects before raising the vehicle with the jack. Do not disengage the parking brake while the vehicle is raised. Make sure that the ground on which the vehicle is standing and where you place the jack is solid, level and not slippery. If necessary, use a large underlay. On slippery surfaces, such as tiled floors, you should use a non-slip underlay, for example a rubber mat. Do not use wooden blocks or similar objects as a jack underlay. Otherwise, the jack may not be able to achieve its load-bearing capacity if it is not at its full height. Never start the engine when the vehicle is raised. Also observe the notes on the jack. – Using lug wrench 1, loosen the bolts on the wheel you wish to change by about one full turn. Do not unscrew the bolts completely. The jacking points are located just behind the wheel housings of the front wheels and just in front of the wheel housings of the rear wheels (arrows). The jack is designed exclusively for jacking up the vehicle at the jacking points. The jack saddle must be placed centrally under the jacking point. If you do not position the jack correctly in the jacking point, the vehicle can fall off the jack and seriously or fatally injure you or others. – Take the ratchet wrench out of the vehicle tool kit and place it on the hexagon nut of the jack so that the letters AUF are visible. – Position jack 3 at jacking point 2. – Make sure that the base of the jack is positioned directly under the jacking point. – Turn ratchet wrench 4 until jack 3 sits completely on jacking point 2 and the base of the jack lies evenly on the ground. – Turn ratchet wrench 4 until the tire is raised a maximum of 1.2 inches (3 cm) off the ground. – Unscrew the uppermost wheel bolt completely. – Screw alignment bolt 1 into the thread instead of the wheel bolt. – Unscrew the remaining wheel bolts fully. Make sure to use the original length wheel bolts when remounting the original wheel after it has been repaired. – Clean the wheel and wheel hub contact surfaces. 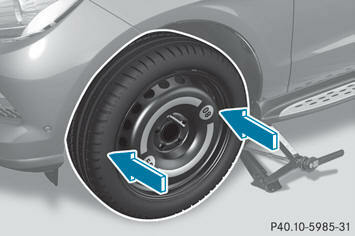 – Slide the emergency spare wheel onto the alignment bolt and push it on. – Tighten the wheel bolts until they are finger-tight. – Unscrew the alignment bolt. – Tighten the last wheel bolt until it is fingertight. – Place the ratchet wrench onto the hexagon nut of the jack so that the letters AB are visible. – Turn the ratchet wrench until the vehicle is once again standing firmly on the ground. – Place the jack to one side. 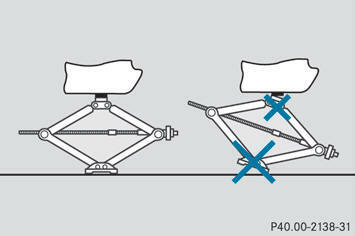 – Tighten the wheel bolts evenly in a crosswise pattern in the sequence indicated (1 to 5). The tightening torque must be 110 lb-ft (150 Nm). Have the tightening torque checked immediately after a wheel is changed. 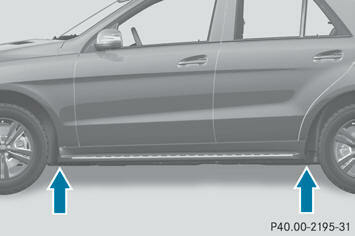 The wheels could come loose if they are not tightened to a torque of 110 lb/ft (150 Nm). – Turn the jack back to its initial position and store it together with the rest of the tirechange tool kit in the cargo compartment. Vehicles with an emergency spare wheel: – Wrap the defective wheel in the protective film included with the emergency spare wheel and transport the wheel in the cargo compartment. – Depending on the size of the wheel, you may also be able to secure the defective wheel in the emergency spare wheel well. In this case, you must remove the stowage tray from the emergency spare wheel well and store it securely in the cargo compartment. When you are driving with the collapsible spare wheel mounted, the tire pressure loss warning system or the tire pressure monitoring system cannot function reliably. Only restart the tire pressure loss warning system/tire pressure monitoring system when the defective wheel has been replaced with a new wheel. 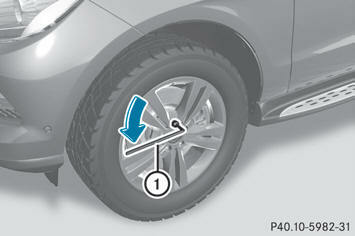 Vehicles with tire pressure control system: all wheels mounted must be equipped with functioning sensors. The defective wheel should no longer be in the vehicle. MOExtended tires (tires with run-flat properties) allow you to continue driving your vehicle even if one or more tires are entirely deflated. MOExtended tires may only be used in conjunction with the activated tire pressure loss warning system or with the activated tire pressure monitoring system. The maximum permissible distance which can be driven in run-flat mode depends on the load in the vehicle. You can drive 50 miles (80 km) if the vehicle is partially laden and 18 miles (30 km) if it is fully laden. The maximum permissible distance which can be driven in run-flat mode is counted from the moment the tire pressure loss warning appears in the multifunction display. You must not exceed a maximum speed of 50 mph (80 km/h). - when accelerating rapidly Adapt your driving style accordingly and avoid sudden changes in direction and sudden acceleration, as well as driving over obstacles (i.e. curbs, potholes), and driving off-road. This is particularly the case when the vehicle is heavily laden. The maximum permissible distance that can be driven in run-flat mode depends to a large extent on the loads placed on the vehicle. It can be shorter due to high speeds, a heavy load, sudden changes in direction, the road surface condition, outside temperature, etc., or further if you drive carefully and conservatively. Do not continue to drive in run-flat mode if: - you hear banging noises. - the vehicle starts to shake. - you see smoke and smell rubber. - ESP® is intervening constantly. - there are tears in the sidewalls of the tire. After driving in run-flat mode, you must have the wheel(s) checked for damage at a qualified specialist workshop which has the necessary specialist knowledge and tools to carry out the work required. The defective tire must be replaced in every case. When replacing one or all tires, make sure that you only use tires marked MOExtended and of the specified size for the vehicle.